The San Francisco Police Department is investigating an early-morning death as a homicide, but is keeping mum on most details in the case. Here's what we do know: Officers were called to the 2000 block of Polk Street, which is between Broadway and Pacific Avenues, at 3:55 this morning. There they discovered a man in his 50s, suffering from undisclosed injuries. He was transported to San Francsico General Hospital, but was declared dead on arrival. Police say that they are seeking an "unknown male" in the slaying, but citing the early nature of the investigation they declined to give additional information on the case. Following the death of Marcus Polk Sr on October 24, this appears to be San Francisco's 47th homicide for 2016. Update: Following publication of this report, an SFist tipster sent a photo from the scene below. It appears to show blood, so please consider it NSFW. 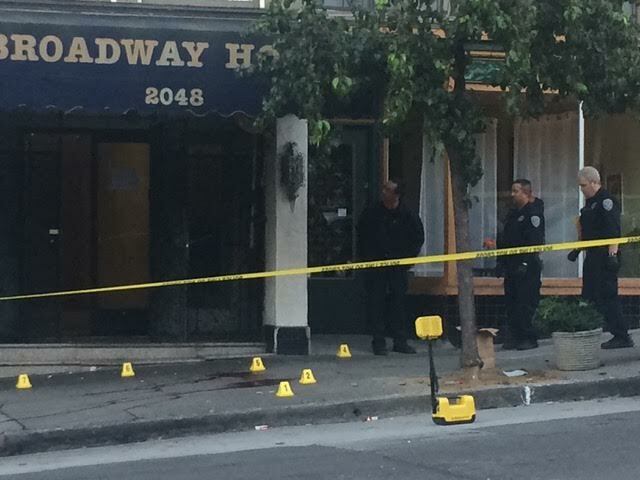 Photo of the scene, sent to SFist by a tipster.